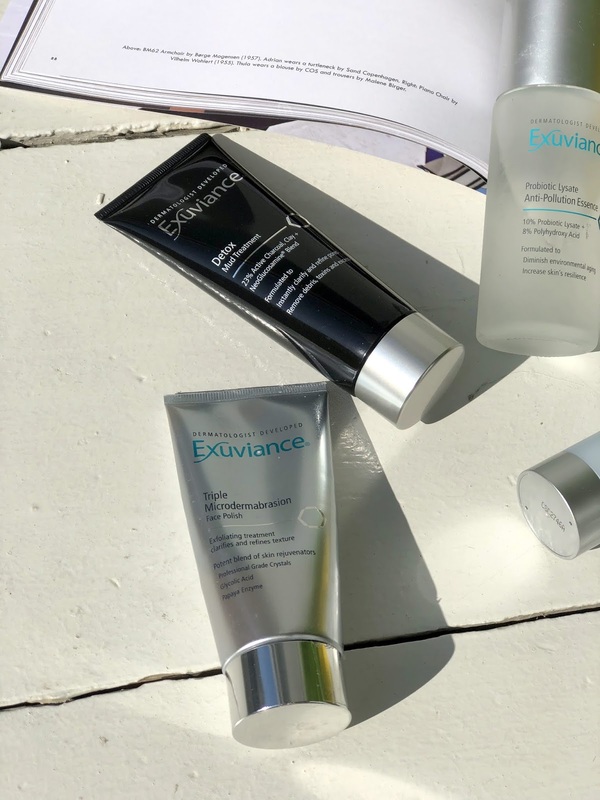 As per your requests, the next brand focus post is Exuviance; a brand I have used and loved for a long time. In fact, when I asked you guys what your favourite #KBTMADEMEDOIT product has been of all time it was the iconic Triple Microdermabrasion that won by a long shot. Followed by Heliocare spf and some other faves that are constant features on my Instagram account. Nice to know: Exuviance is cruelty free. Right, let's start with the most iconic #KBTMADEMEDOIT product. If you haven't heard me harping on about this, then you must be new around here. It's just so darn good, hence me not being able to shut up. It is always my go-to as a recommendation for exfoliation as it is such a multi-faceted 3-in-1 product and is a saviour for so many skin issues; from texture and fine lines to dark spots and hydration. As you may well know, there are various ways in which you can exfoliate (all explained in this post) - and this product is all of those combined; a chemical, physical and enzymatic exfoliation in one. DREAMY! It contains crystals to smooth the skin (physical part), a Papaya Enzyme (enzymatic part) and Glycolic Acid (chemical part). These all help in dissolving impurities and dead skin cells that contribute to congested pores, dull looking skin, poor texture, dehydrated skin (due to the skins inability to absorb product properly) and general lack-lustre-ness. I love that this can simply be applied and left to work it's magic or you can apply it and use the 'scrubby' part of it on really congested areas, like the nose and chin. I also love that this is the one product I can recommend and be rest-assured that you guys will see fab results. I have had so many follow-up messages post purchasing this product remarking on how amazing your skin feels and looks. It's a goodie and will FOREVER be a part of my routine and my absolute number one exfoliator of choice. You can see this post about Understanding Exfoliation, where I speak to this product. R995 - link. This is one of my absolute best detoxifying clay masks. I love it so much as it's still gentle on the skin, yet leaves me feeling decongested, super-clarified and is great for any breakouts (you can even use it as a quick spot treatment). It dries out the unwanted excess oil, but doesn't leave the skin completely parched. This mask also gives the skin a light exfoliation so great if you are sensitive with blemish-prone skin as the NeoGlucosamine (a non-acid amino-sugar exfoliator) will leave the skin feeling polished. The mask has a charcoal base (Japanese Binchotan Charcoal) which acts like a magnet, sweeping up surface pore-clogging impurities and environmental toxins, to provide the ultimate detoxifying cleanse. I love using this mask and reach for it at least once a week - it really is such a treat to use. R874 - link. I have spoken about this on my stories recently, and because it's the latest launch from the brand, it has only been in my routine for the past 2 months BUT I adore it. I haven't actually used an essence in my routine previous to this one, so have loved adding this step, especially because this essence is something pretty unique in terms of its ingredients. It contains a pro-biotic called Lysate which aims at targeting the skins microbiome to help re-balance, moisturise and strengthen the skin. 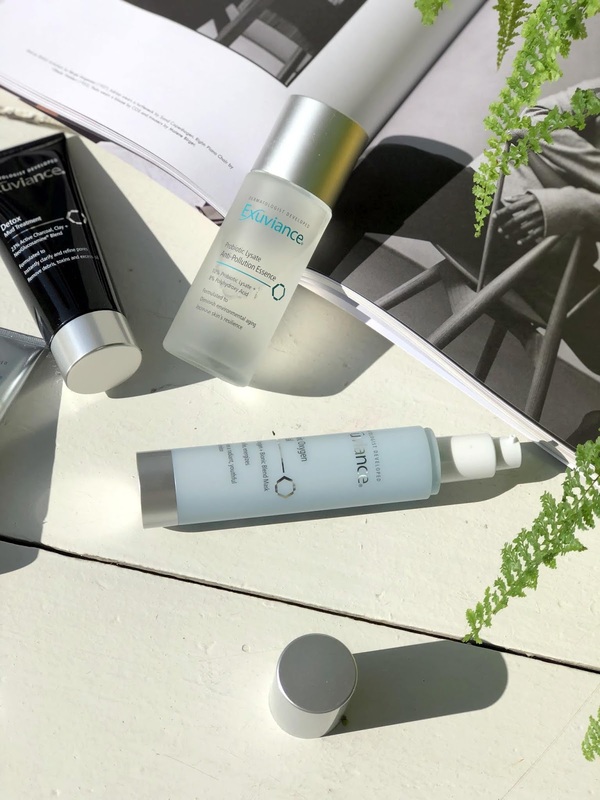 Basically, exactly like a pro-biotic supplement would strengthen your gut, this will assist in strengthening your skins barrier (which is vital - learn more in this post) as well as relieving the skin of oxidative stress. I use it after cleansing and pat the liquid onto damp skin. It leaves my skin feeling hydrated and my barrier issues have cleared up completely since incorporating this. I don't foresee myself going without this product in my routine! R700 - link. This is one of those masks I reach for when I am just not enjoying the state of my skin and need that quick 'pick-me-up'. It works wonders on so many issues; from tired, lifeless skin to post-treatment skin. It's soothing, oxygenating, invigorating and so incredibly easy to use. I apply a layer all over the skin which forms into a light 'bubble mask' effect. This then dies down and leaves a layer of nourishing ingredients on the skin. I have slept with this on before (but it does feel a bit tacky, so usually rinse this off after a few hours, but a few minutes will do too). My skin drinks it up! I find this mask great for flared up skin too, it's a pretty safe bet for irritable skin. Tip: this is a great combo for after use of your Triple Microdermabrasion. R1190 - link. One jar contains 60 capsules and I choose to use these once a day, so it lasts me 2 months. 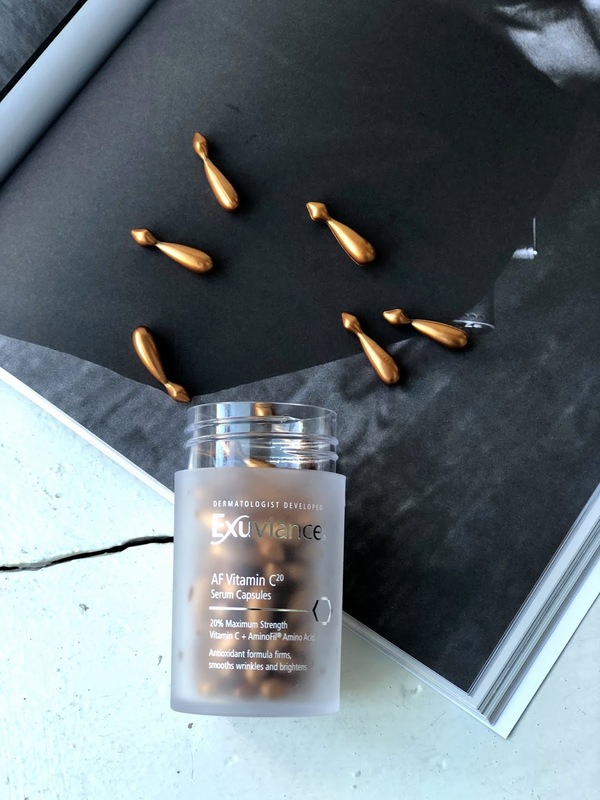 These are Exuviance's answer to a potent Vitamin C concoction. Each capsule contains your L-Ascorbic Acid (Vitamin C) at 20% strength, which is very powerful (read this post to learn more about Vitamin C), as well as an ingredient called AminoFil which aims at helping with the skins firmness, fine lines and general volume. The texture of these capsules is an odd one, and what would best be described as a cream-meets-serum. It can feel quite mattifying on application (this is thanks to the Vitamin C). It absorbs quickly and I enjoy following with a hydrating serum of choice and my usual spf. You will feel this product working on the skin - as I say, it is potent, but a great addition to assist with pigmentation, general tone and general skin health (we all need a good anti oxidant, which your Vitamin C obviously is). R1180 - link. 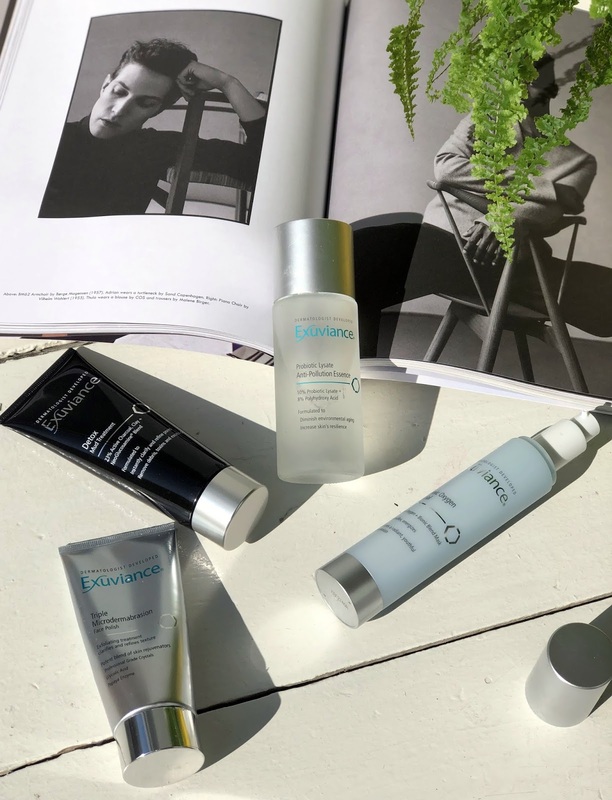 You can shop all Exuviance products on Dermastore and Skin Miles. See this site for stockist details. Thanks Tori! Already love the Triple Microdermabrasion so would definitely consider more from this brand.